As a buyer's agent, your commission will ultimately depend on your buyer's motivation and ability to buy a home. If you neglect to qualify, or vet, prospective buyers before taking them on as clients, you can be left with nothing but frustration and no commission. That's why experienced agents generally arrange initial in-person meetings with prospective buyers to find out how committed they are to actually buying a home and to get a feel for whether they have the financial ability to do so. 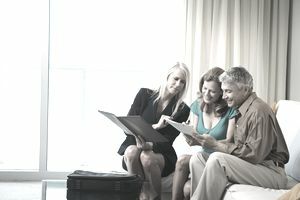 As part of the qualifying process, agents might even ask prospective buyer-clients to sign exclusive buyer agency agreements, which ensure the agents will get paid when their sales transactions close. One should be looking at the qualification of buyers here in two contexts. First, you want to try to determine their real estate wants and needs in relation to their financial capability. Second, you want to determine the level of involvement in working with them based on a number of factors, including their urgency. If you're really hungry, perhaps any buyer with a pulse is worth your time and resources. However, many an agent has been burned out early because they used up their money, time and enthusiasm on buyer prospects who were not motivated at all. It can be important to be selective in your business as to who you work with. Most of this discussion is about a buyer that's sitting in front of us and ready to go look at properties. However, the game is quite different if it's an internet buyer prospect. Time frames stretch, as internet buyers start their searches much earlier and spend more time in research. If you dismiss or procrastinate in serving a web buyer prospect because they say they will be buying in a "year or so", you'll probably not work with many. You'll also lose a lot of business in the future. No one wants to spend their time and vehicle expense with buyers who are unable financially to purchase the properties they're being shown. That said, there are a huge number of variables in play here. If you work in a market with a lot of first-time buyers, you will be well-served to try to encourage them to get a mortgage pre-qualification letter. They might not even know what they can or cannot afford. If you work in a resort, vacation market, or luxury market, you may not want to take that approach for fear of annoying the buyers. In that case, an internet search and polite questions about their business might be helpful. In your excitement and drive for a sale, you might show properties to buyers who appear less-than-motivated in their real estate search. Sometimes, due to fear of sales pressure, buyers will use an unconcerned attitude to mask a really high interest in finding a property. Asking questions and getting them comfortable with you might clarify their intentions. If it's clear to you that they have no intention of making a purchase in the near future, you need to decide how much time you want to spend with them. Though you may lose them, you can print up listings for them to drive by or do open houses. If buyers are looking outside of your normal service area, or they are in the market for properties with which you have little experience, you might find it advisable to refer them to an agent better suited to work with them. Perhaps your website gets a prospect to you that wants property in your MLS, but a 50-minute drive across town; you may find it better for your time and expense to refer them to an agent in that area. Perhaps they're looking for commercial property and you're inexperienced in that area. It would definitely be better to refer them out in this case. You've just met a buyer prospect in your office and they spend the first 15 minutes of the conversation relating bad experiences with other agents. Or they tell you how they've always been mistreated in previous real estate dealings. These could be clients who will end up as plaintiffs. If you're getting a bad feeling, pay attention to it, as it could keep you out of court in the future.